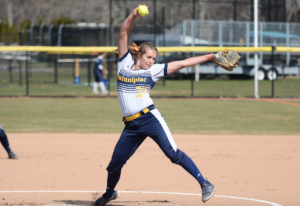 The Quinnipiac softball squad lost to Yale on Wednesday 8-0 in five innings, but there was more to the day than just a loss shortened by mercy rules. It was “Chris’ Game,” which occurs when the Bobcats (16-18) play the Bulldogs (8-22). The game is dedicated to the memory of Quinnipiac assistant coaches Rocco and Lynn Labbadia’s son who past away as a result of a car accident in 2016 at just 19 years old. Chris was driving to a neighboring town to give a friend their wallet back, which they had left behind. The two teams came together before the game to hear some announcements and for a ceremony celebrating Chris. At the time of his passing, his sister, Brittney, was a member of the Bulldogs softball team. The game didn’t progress in favor of the Bobcats as they were unable to get their bats going throughout the afternoon. The team only mustered two baserunners on two hits and no walks. The Bulldogs were all over Bobcats’ starter sophomore Abbey Long, going off for seven hits and eight runs, five of them earned. Long also finished with fives and only one strikeout. Three Bulldogs tallied multi-hit games on the day and one had multiple RBIs. Junior catcher Madison Sack finished her day with two hits and two RBIs in three trips to the plate, while having three put-outs and one assist in the field. They were aided by the Bobcats’ three errors in the field. A surprise came when senior pitcher Casey Herzog, the Bobcats’ No. 1 option to take the mound, didn’t get the start today. The Bobcats are looking ahead to a busy weekend traveling to Marist on Saturday before heading back to Hamden for a double header with Iona on Sunday. While they will be looking forward, it’s not always a bad thing to take a look back.